Kids are naturally drawn to bright colors; the brighter, the better! While it’s fine as long as this attraction is limited to clothes and toys, as a parent, you can’t help but raise an eyebrow at foods that are blindingly bright! One classic example of bright foods are jellies and gummy bears – also examples of what my kids love! As is with most colored foods, these are also extremely high in sugar, and I had a hard time keeping these away from little hands! So it was a pleasant surprise when I was approached by Dr. Gourav with a pack of colored bears called Chubears – that were actually healthy! Chubears are chewable vitamins that look like, you guessed it – gummy bears. I generally refrain from giving vitamins as supplements; I prefer kids getting vitamins through dietary sources but hey, I’d pick gummy bear vitamins over their sugary versions any day! The first time I heard about Chubears, I wasn’t sure about them, but after trying them out, I’ve changed my mind. To know why, read my detailed review below. 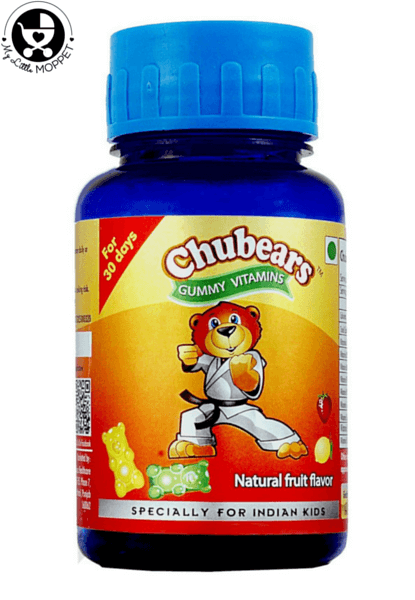 Chubears Gummy Vitamins are available on the product website as well as on MyLittleMoppet Store. They are available in a bottle of 30 gummies which costs Rs. 395.00. 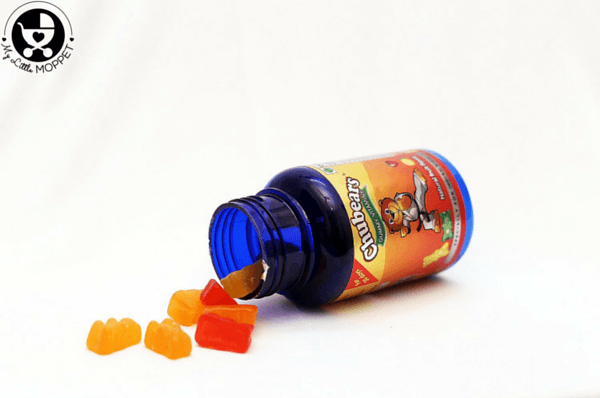 Chubears Gummy Vitamins are available in three flavors – Strawberry, Orange and Pineapple. The bottles have a shelf life of 2.5 years. In my experience, Chubers tasted very similar to gummy bears, without the excessive sweetness. The packaging is good with a sturdy bottle and child-proof lid. The colors of the gummies are bright enough to attract kids and are chewable, which is great for kids who have trouble with swallowing tablets. After trying out Chubears, I have to say I’m impressed!! I would never have expected anything that looked like gummy bears to be healthy, but Chubears fits the bill perfectly! I’d recommend Chubears as a good alternative to sweet treats, especially if your child is a fan of bright-colored candy. The fact that Chubears is targeted specifically to the needs of Indian children is a huge plus point. Indian kids are often found to bedeficient in certain nutrients and to have a vitamin that fills exactly these gaps in a child’s nutritional profile is indeed a blessing! My Daugther is very fussy about taking medications and we tried all types of multivitamin syrups and gummies available on the market but she had an aversion to all. Chubears was introduced by a friend couple and my daughter developed instantaneous liking for it. She fondly calls them Chubies. And is happy to pop them in the mouth. I checked the dosage of daily requirements of different vitamins for kids and found that Chubears fulfils the daily requirements of 2-10 years olds.